Smaller clubs with fewer tables do from my experience, tend to give more extreme results either tops or bottoms and fewer in between for players to compare their performance with. This can be off putting to some players enjoyment of the game. One option that has helped to some degree, is the use of machine dealt hands that do generally give a more even distribution of HCP between E/W & N/S and a better chance for either side to show their bidding and playing skills as some recompense for the extreme results. 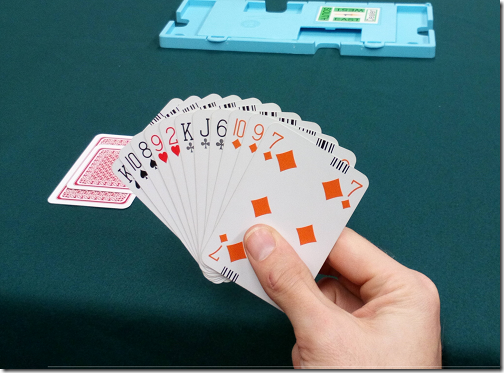 Machine dealt hands also have the advantage of being downloadable to the club scoring software which can then be displayed alongside individuals scores on the club website and the possibility to then revue their play of the hand if they wish. In my area it has been possible for two local smaller clubs to help each other by the sharing of a dealing machine when the scoring players play at both clubs.